During the procedure, the interventional radiologist is carefully monitoring the situation on a TV screen using X-ray guidance and injects a special X-ray dye (contrast medium) into the target blood vessel. If the result is satisfactory, the catheter is removed and pressure or a small collagen plug is applied to the artery to stop the bleeding. An unsatisfactory result after the balloon dilatation may require the interventional radiologist to place a stent. Stenting is a procedure which uses a small tubular device (stent link to picture), often called an endoprosthesis, which provides support to blocked blood vessels, and other tubes in the body. It acts as a scaffold to reinforce the wall of the vessel and prevent it from closing down. A stent is most often made of medical grade metal or plastic and can be used to treat many different conditions that cause narrowing or obstruction to vessels and tubes in the body, such as plaque, scar tissue or cancer. The tubes carrying urine, leading from the kidney to the bladder, called the ureters. 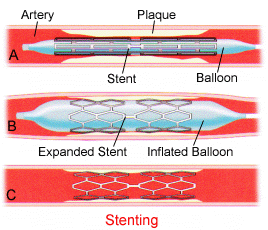 Stents can be mounted on balloon catheters or be self-expanding. Newer devices may be coated with drugs or they may have a plastic or fabric coating and be able to act as a graft. Angioplasty and stenting have revolutionised the treatment of many diseases previously requiring surgery. The minimally invasive treatments now allow the treatment of many diseases to be preformed without open surgery. Stop taking warfarin at least 48 hrs before the test. A clotting test will be performed on the day of the test. If you are diabetic, you must call our office for special instructions. Please inform us as soon as possible if you are allergic to x-ray dye, or iodine, as we can plan to take special precautions or give you special medication prior to your procedure. You will need to lie flat on your back for a minimum of 2 hours in the recovery room, during which your blood pressure, pulse and respirations will be monitored by the nursing staff. You will be given something to eat and drink and any accompanying friend or relative will be permitted to sit with you. You will most likely be admitted to hospital following your procedure, and therefore once your recovery room observations are satisfactory, you will be taken to your hospital room. If you are being discharged home, you will be observed for a period of 4 hours, after which you may get dressed and escorted by a member of the nursing staff out of the department. You will not be permitted to drive or take public transport home. Someone should drive you home or you may take a taxi. Elderly or frail patients or those who live alone or a great distance from the hospital may be admitted to hospital overnight. You should rest and take it easy for 1-2 days following your procedure. Do not drive a car, operate machinery or take a hot bath or shower for 24 hours. You should drink plenty of fluids; resume your normal diet and resume taking your normal medications. Try to keep the bandage on the catheter insertion site for a day or so, then it can be removed. You start to bleed from the puncture site or there is increasing swelling at the site. Your limb feels cold, numb, painful, or there is a change in colour. There is increasing pain or colour change or numbness in the foot on the side of the procedure.